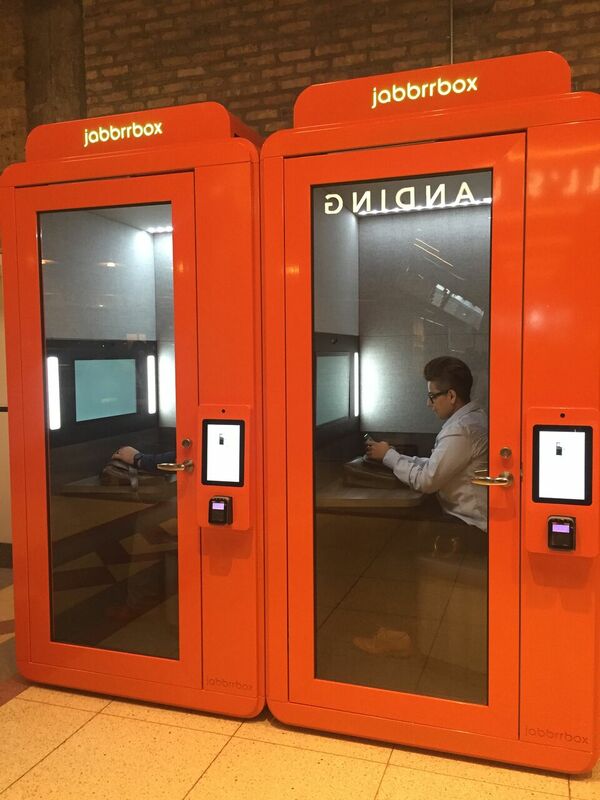 by Brianna Crandall — June 20, 2018 — Jabbrrbox, a solutions-based company innovating for today’s mobile workforce, announced last week the permanent installation of its JabbrrX private workspace in two locations at the Merchandise Mart in Chicago, where the innovative “space-as-a-service” took home a Gold award in the Workplace Technologies category in the prestigious Best of NeoCon Competition. The timing coincided with the 50th edition of the NeoCon contract furnishings show and offered the 50,000 showgoers the opportunity to experience the new solution. Located on the second floor adjacent to Marshall’s Landing, the two JabbrrX workspace booths will also provide the building’s 38,000 daily visitors with an on-demand, reservable and private office going forward. We’ve identified some of the most prestigious and most trafficked locations in the country. As theMART is the world’s largest commercial building, it’s the next logical location to expand. It also holds a special place, as we launched our company here at NeoCon 2017. Installed at the building’s center of gravity, Marshall’s Landing, JabbrrX not only meets the Mart’s discerning design needs, it also provides much-needed private space in an otherwise busy area. The comfortable interior of the booth features superior acoustic qualities as well as proprietary enterprise technology developed with Andrew Southern, chief technology officer of Jabbrrbox. It is outfitted with lighting adjustments, wayfinding, and secure Wi-Fi for a private, encrypted network. As an on-demand consumer amenity, users are able to access JabbrrX in 30-minute increments ($15/30 minutes), with a door passcode and Wi-Fi password provided at the time of reservation. Expansions include Bluetooth connectivity for hands-free calling, in-booth speakers for enhanced clarity and music, a camera for video conference calls, and screen-sharing capabilities. 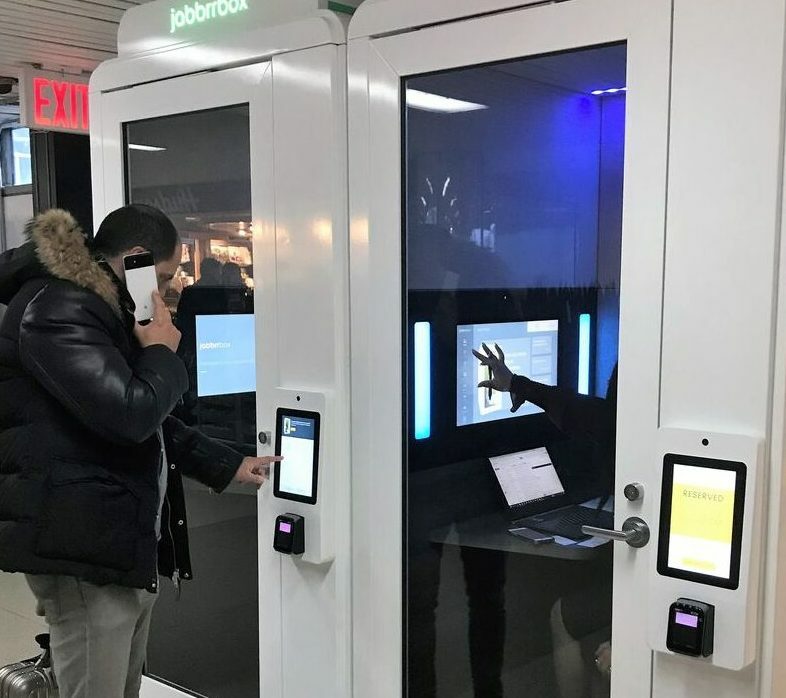 The Mart marks the second public installation for Jabbrrbox, with plans to continue to expand its on-demand consumer service in a wide variety of open and semi-public spaces including building lobbies, hospitality, conference venues, retail, transit hubs, additional airports, etc., throughout 2018. For more information, visit the Jabbrrbox website.